All festival activities (except the Sunday evening Gala) take place in and around FOLKETS HUS in the town square of Bagarmossen in southern Stockholm. Our “home base” during the festival is in the Folkets Hus foyer, where we have our STF Reception & Café, and that is where you check in when arriving. Taxis are of course always available directly outside the all airports, but that will be the more expensive option if not traveling in a group. There's only one exit and out on the square you'll see an orange brick building to your right. 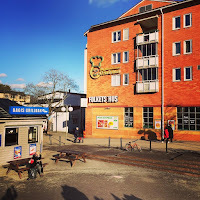 That is the festival venue Folkets Hus and the entrance is around the corner. NOTE!! The metro runs all night long during STF. From Thursday night to, and including, Sunday night.